a INSTITUTO DE CIENCIAS, Universidad Nacional de General Sarmiento. J.M. Gutierrez 1150 (1613). Los Polvorines, Prov. de Buenos Aires. Argentina. b INQUIMAE – DQIAQF, Facultad de Ciencias Exactas y Naturales (UBA). Ciudad Universitaria, Pabellon II (1428). Buenos Aires. Argentina. Electroanalysis offers an interesting tool for palladium quantification by using adsorptive stripping voltammetry of Pd-dimethylglioxime complex on mercury . 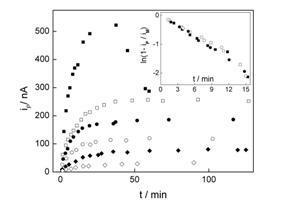 Here we show that complexation kinetics and solubility in the homogeneous phase, in addition to surface concentration, are relevant analytical aspects to be considered. Complexation kinetics is first order in both Pd(II) and the ligand (k = 15 s-1M-1 ). This determines the chemical equilibration time after each metal addition: for example when using 1 x 10-4 M H2DMG a non negligible chemical equilibration time ca. 1 hour should be considered. The upper limit of the linear range is determined by two factors: complex solubility in the solution (ca. 2.5 μM) and surface concentration. The latter should develop a redox charge lower than 30 μC cm-2 .